Natural/Organic Deals – BOGO Scotch-Brite Botanical Disinfecting Wipes NOW FREE!!! 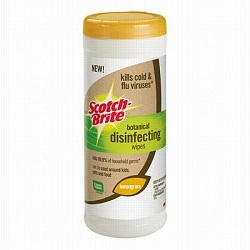 The BOGO Scotch-Brite Botanical Disinfecting Wipes coupon is now even better! They are on sale B1G1 Free at Winn Dixie right now so that makes 2 free with each coupon! Click HERE to print up to two of the coupons. If you don’t have a Winn Dixie nearby they are still only $1.24 at Walmart! ← FREE Signature Collection Pretzel at Auntie Anne’s!